As promised, we are putting to good use the Salted Caramel Sauce we made yesterday. For me, the combination of salty and sweet doesn’t shine more than through a cookie. And there is no better recipe to do it with than this one. 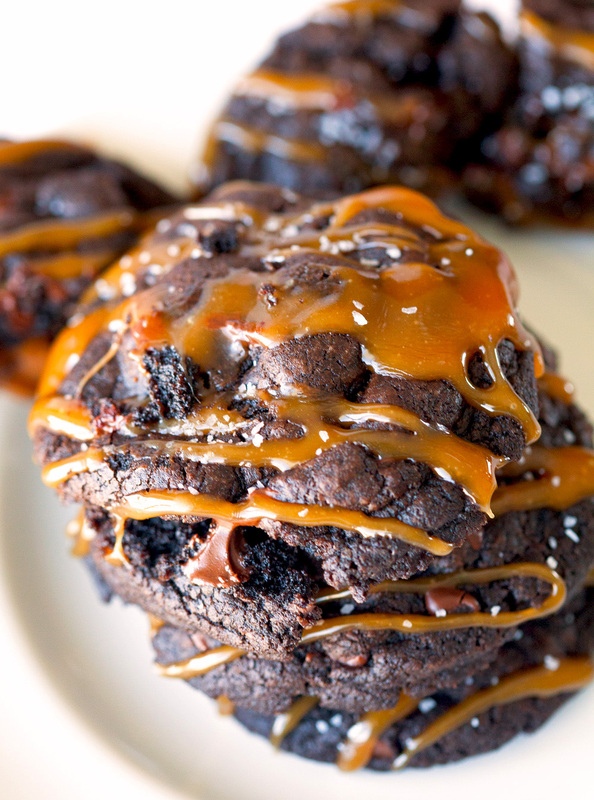 These dark, fudgy, and triple chocolate cookies are beyond delicious all on their own, but once you stuff them with caramel, you will never look back. The reason why I am so enamored with these cookies is that they taste like individual brownies. It’s the best thing ever. Especially since I’ve been on a brownie kick lately. Aren’t you glad you don’t have to choose between cookie and brownie today? Since I am beyond indecisive, I am always relieved when I don’t have to make a choice between two things I absolutely adore. You can’t lose. Triple chocolate sounds beyond amazing to me. It’s music to my ears, really. I love the moment when regular cookie dough turns into chocolate cookie dough, which gains an even deeper color with the addition of melted chocolate and finally receives a big sprinkling of chocolate chunks and mini chocolate chips. Isn’t it great how many times I was able to use the word chocolate already? I also should mention that I am using Rolo candies for the inside of these cookies. 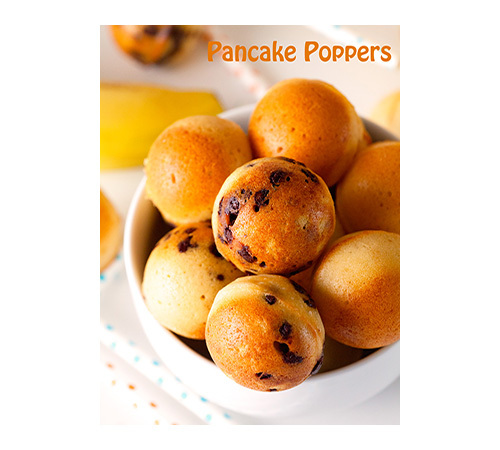 I think it’d be pretty difficult to fill a cookie ball with caramel sauce. Even I am not up to that challenge, ha. 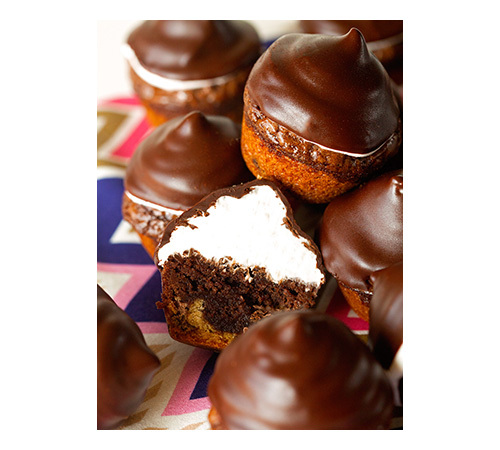 Each cookie dough ball encloses a Rolo candy and gets baked to perfect goeyness shortly after. 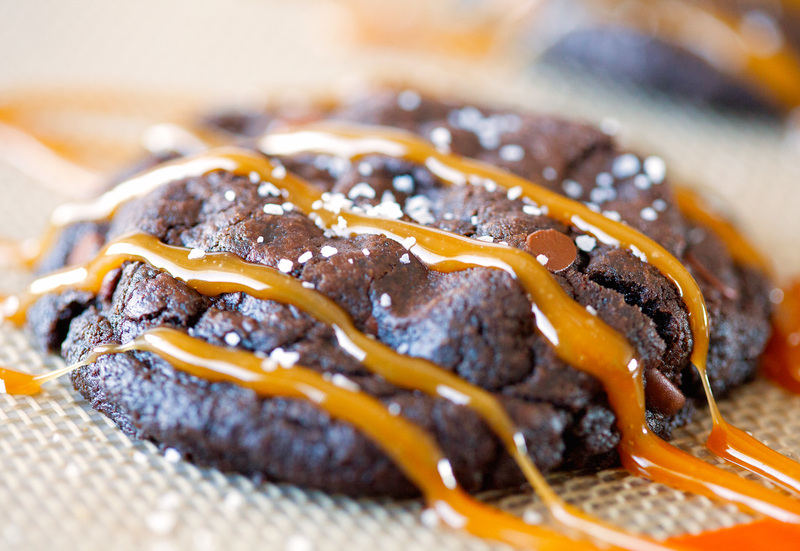 Once the baked cookies have had time to cool, I drizzled over warm salted caramel sauce and topped them with additional sea salt. 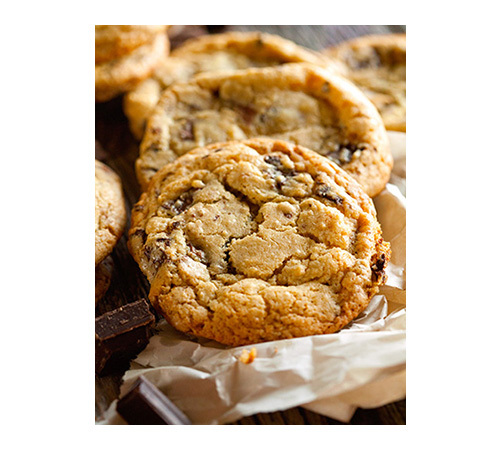 Please try a freshly baked cookie – the textures are insane. Using two different caramels makes for a crazy flavor experience as well. 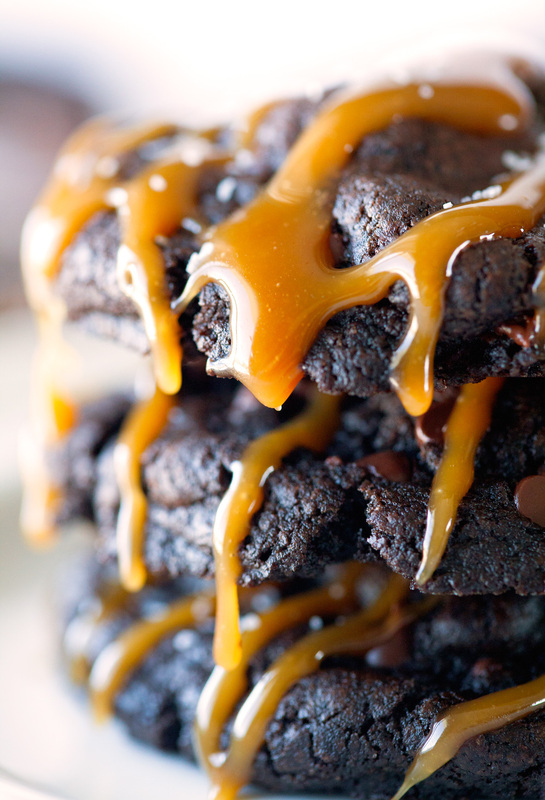 Triple chocolate, double caramel and scrumptious cookie dough – it’s what dreams are made of. Seriously, I dreamed about these cookies. Yep, I am certain we made good use of caramel sauce today. And if you’re still thinking about whether or not you should make your own caramel sauce, I really hope you do. It makes a huge difference here. Just in case you missed it, here’s the link. Let’s make insane cookies together. Alright, I’m off to helping my hubby clear our snow once again. The forecasted blizzard didn’t disappoint. We’re still getting in final numbers of how much snow we got, but we’re right around 8 inches or so. Keeping our fingers crossed this was the last big snow fall this winter. I learned all about Thundersnow yesterday. Very cool and very scary. Wishing all of you a fantastic weekend! 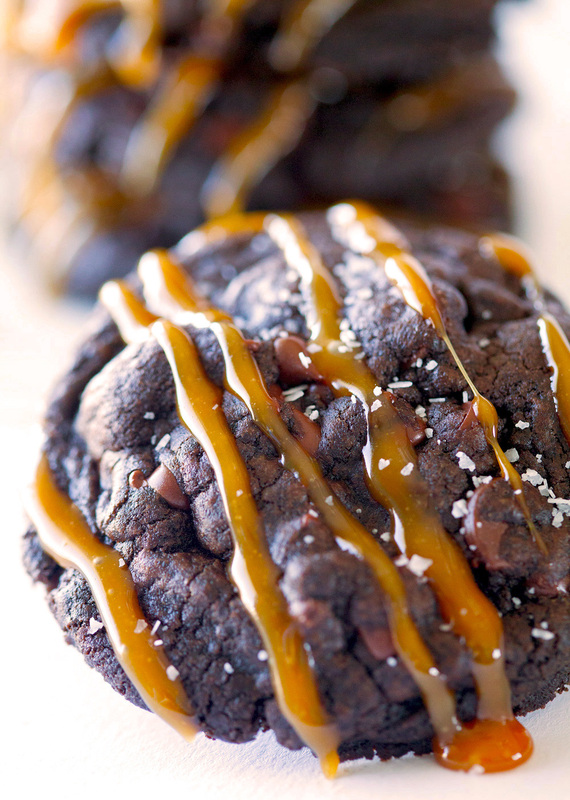 The ultimate cookie for the chocolate and caramel addict. These cookies are a foodie experience. 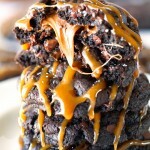 Extremely gooey, fudgy, crunchy, and scrumptious! 1. Melt 2/3 cup chocolate chips in the microwave or with the help of a double boiler. Set aside. Sift together flour, cocoa powder, baking soda and salt. Set aside as well. 2. In your stand mixer, cream together butter, brown sugar and granulated sugar. Add egg and vanilla and stir until incorporated. Add melted chocolate chips and give it a good stir. Now add dry ingredients to the wet ingredients and mix well. Add chocolate chunks and mini chips. Cover and refrigerate dough for at least 1 hour. 3. Preheat oven to 325 degrees F. Line a baking sheet with parchment paper. Scoop out 3-4 tablespoons of dough (per ball) and wrap around a Rolo candy. Repeat with remaining dough*. Place in the oven and bake for 15 - 18 minutes or until tops of cookies have a cracked appearance. Let cool for 10 minutes before transferring to a wire rack to cool completely. 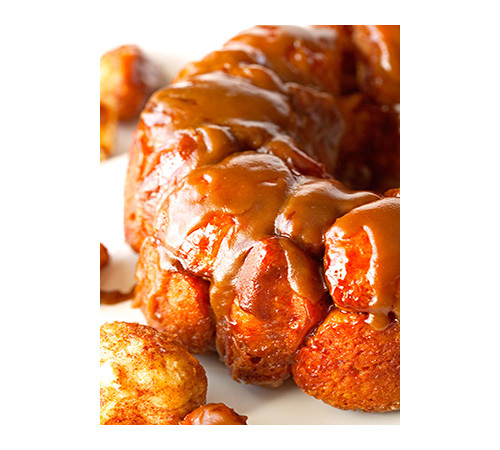 Drizzle with warm caramel sauce and sprinkle with sea salt, if desired. Enjoy! Cookies will keep up to 5 days in an airtight container or up to 4 weeks in the freezer. *I returned my cookies to the fridge for 30 minutes before baking because my hands warmed the cookie dough balls more than I had hoped. Cookies turn out best when baked cold. I placed the cold cookie sheet into the oven and baked them without any problems. These do indeed look like amazing cookies. I want to reach right into the screen to grab one. Thanks for a great recipe! Pinned! I couldn’t have been happier with the way these turned out. They will definitely be staple in our house from now on. Thank you so much, Donalyn!! These cookies just blew my mind. I need all of that caramel, haha. And on top of triple chocolate cookies!? These look amazing! Need is the right word, ha! You are too sweet, Beth. Thank you! Wow! Kathi, these are gorgeous. 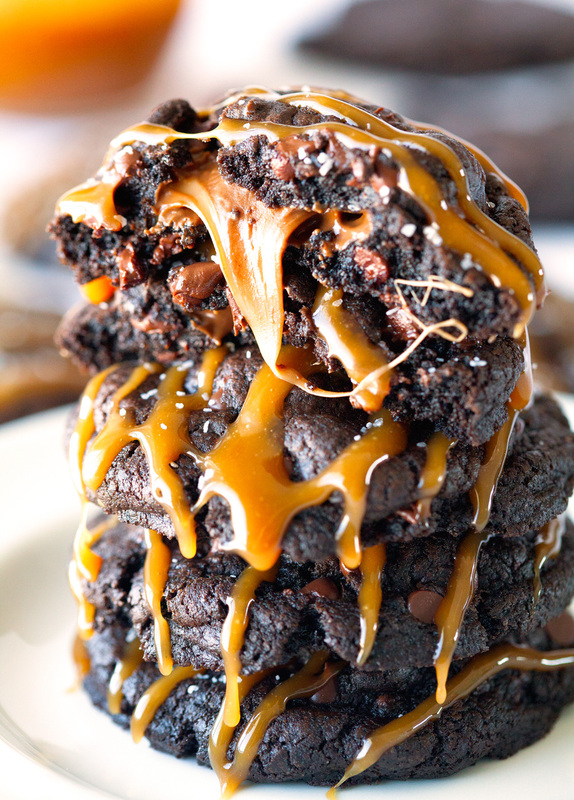 A brownie in cookie form? Drizzled with salted caramel sauce? Sign me up! OMG these are mindblowing! Seriously! Pinning now! You are da best!!! Thanks, lovely! Haha – happens to me all the time! Thank you, Helena! OMG! Kathi, these cookies…you know how a picture can be worth a 1,000 words…well your pictures or worth 10,000 words. Yum yum yum! Pinned! That is one of the sweetest comments ever! Thanks for the love, Justine. You rock! My… freakin’… goodness. 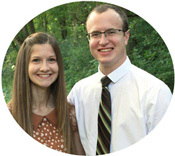 HOW DID I NOT EVER KNOW ABOUT YOUR BLOG?! Lady, your photos are absolutely lustrous and brilliant, your recipes insanely delicious looking, and the ingredients you combine so perfect. This recipe looks amazing. Okay seriously these photos!!! 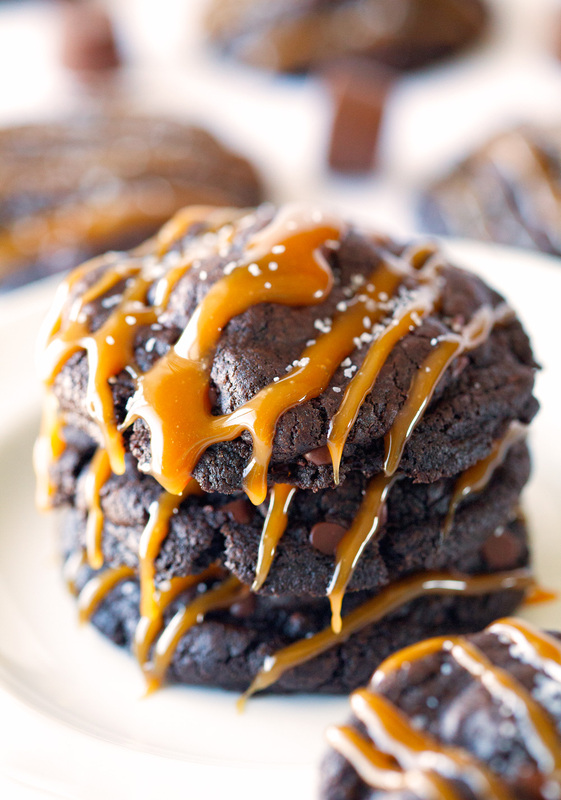 And I am in love with that caramel on these cookies – what a yummy combo!! And rolos in the middle? Can I pleassssse be your neighbor?! That would be the best thing ever! Can you even imagine how crazy it would be if we actually lived next to each other?? You are too kind – as always. Thanks, Chelsea! 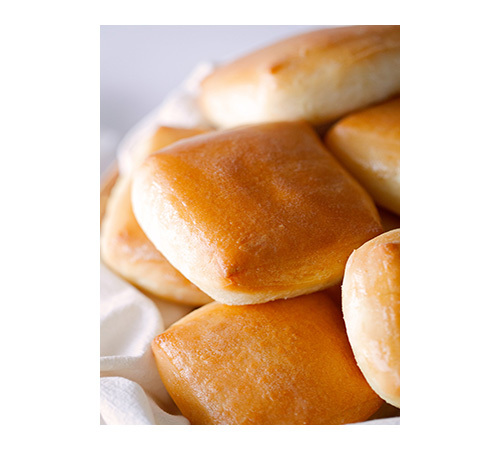 they look ooey gooey and amazing! They won’t disappoint – I promise. Enjoy! LOVE. I made a similar cookie this past Christmas but stuffed it with a Rolo AND Nutella. It was pretty amazing. I love the salted caramel drizzle! That sounds amazing. I’m a huge Nutella fan – you might have planted a seed for a future recipe :). Thanks, Amanda. Yeah, the caramel is my favorite part. It’s just so darn delicious and addicting!! OMG, are you kidding me?! I need one of these right now! I really wish I could share! Thank you, Shiran. Hope you’re having a great weekend!! Oh my gosh these look amazing Kathi! These is no better combination that caramel and chocolate. I know, I know peanut butter…but salted caramel beats it for me. 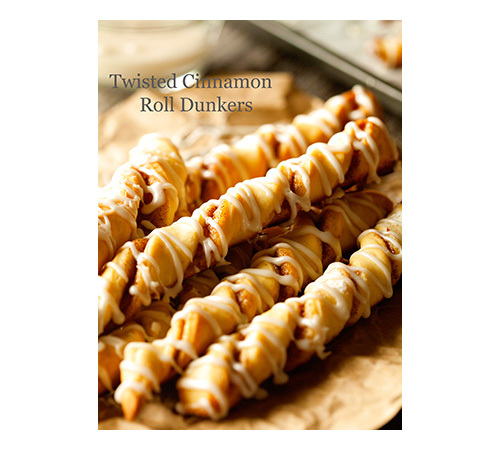 Making these!! Pinned! 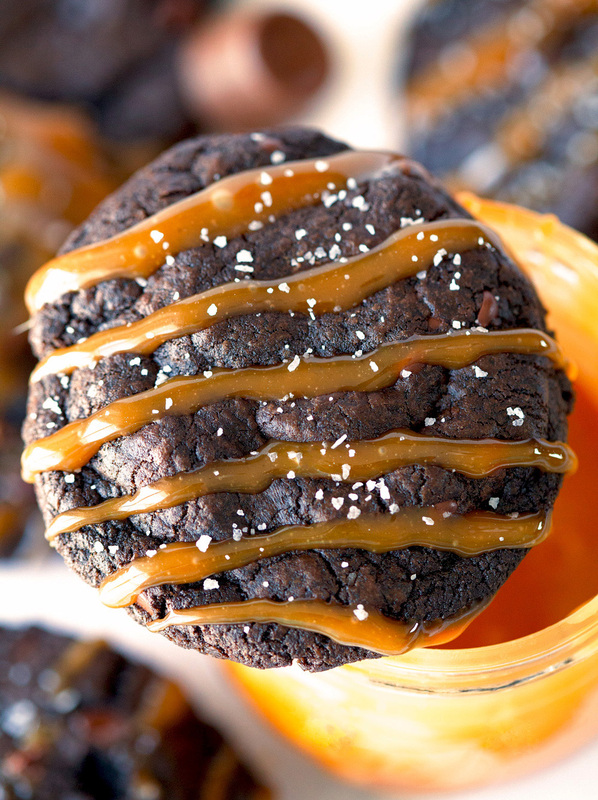 I totally agree – pb & chocolate have a special place in my heart, but salted caramel and chocolate make an even better pair. Hope you enjoy! Oh goodness, these look insane. That sound was my belly grumbling! 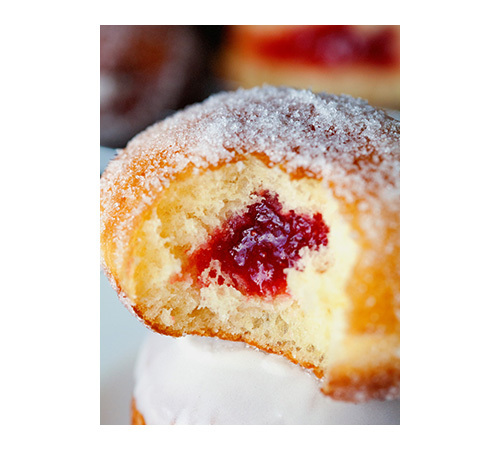 Hahaha, I hope you’re able to fix that grumbling with a couple of these :). Thank you so much, Pamela. I’m the type of person when I see something I end up craving it all week until I have it. Now I have to make these cookies because they look amazing!! I love that yummy caramel topping! I know exactly what that feels like – story of my life, ha! 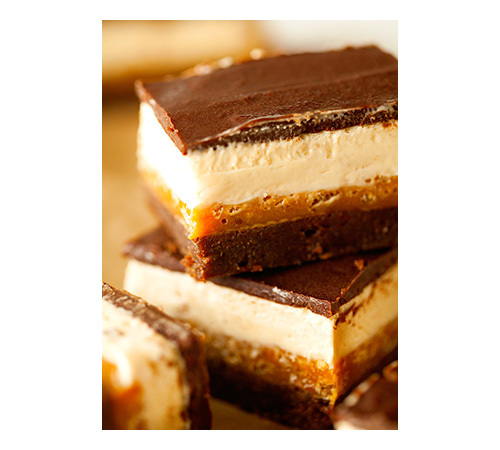 The caramel is my favorite part – I am pretty sure you will love it. Thank you for your sweet comment, Layla!! omg! best looking thing i have seen on the web all day, maybe all week!! Thank you so very much, Greg. Hope you enjoy!